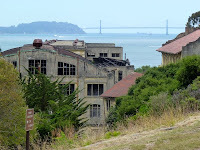 Thank you to Alec who joined me in this trip to Angel Island today. 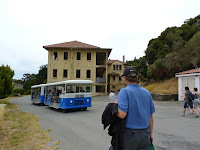 This afternoon we started from the Ferry stop in Ayala Cove, on Angel Island, and walked around the perimeter loop trail around the island and back to the ferry station in Ayala Cove. 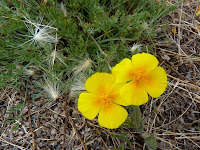 We experienced a fairly typical weather pattern -- overcast in the morning, and sunny later in the afternoon. 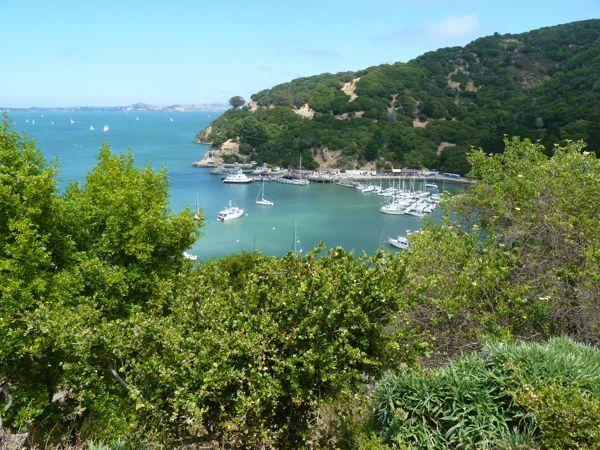 For hikers, the most direct way from the ferry stop to the beginning of the perimeter trail is to head straight and to the left when you disembark, past the restrooms, and up a few sets of stairs and a hill. (Bikers have a separate path.) Unless you choose to take the trail up to the top of Mt. 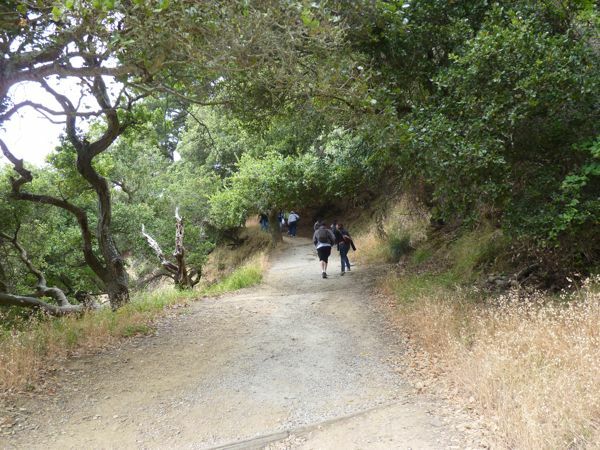 Livermore, with the exception of one other fairly steep hill, the trail is relatively flat. 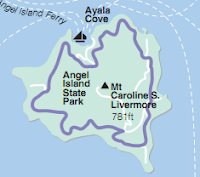 Technically Angel Island is not part of the main Bay Trail. However, the island is shown as a connector/connecting trail (solid purple line) on the Bay Trail Map (Marin sectional map) -- and it is well worth visiting if you get the chance. 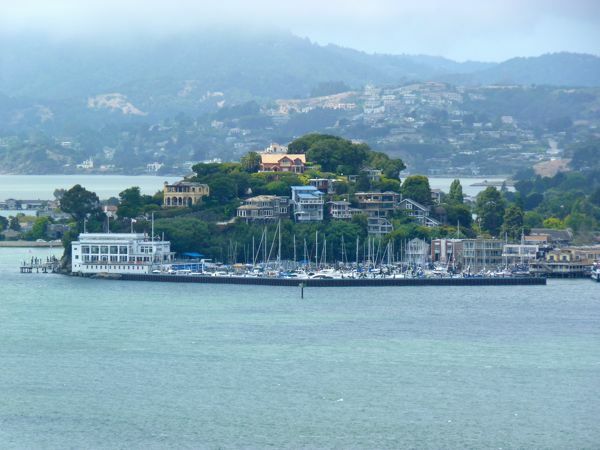 There are some unique historic points of interest, old/abandoned buildings, and scenic views of San Francisco, the back side of Alcatraz, and of Tiburon, that you would not normally get to see. 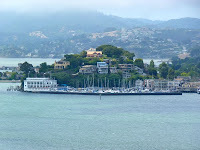 And if you take the Ferry, you'll also get a unique perspective on the other parts of the overall Bay Trail landscape. For hiking more than two hours, there was not a huge amount of wildlife to report, but that also may have had to do with large numbers of people on the island on this summer weekend day (Saturday). In addition to picnic and barbeque areas, visitors can take a covered shuttle or segway tour of the island, or bring or rent bicycles to take their own two-wheeled adventure. 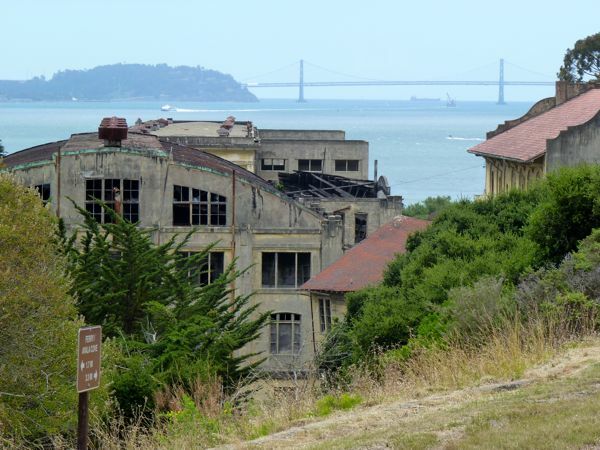 Skates, skateboards -- and dogs are not allowed in this state park. Walking at a relatively brisk pace (which limited picture taking and rest stops), we had just enough time to walk this loop trail in a few hours, and grab something to go from the cafe near the ferry stop, before having to line up for our boat back to Alameda. Another hour would have been nice to explore and visit the immigration station site. 1 blue jay; 2 crows; 1 kite (bird); 2 turkey vultures; 1 bumblebee; 2 sea gulls; 8 Canada geese.